The East West Railway Company has revealed the five possible routes for a new railway which will provide a vital link between Cambridge, Milton Keynes and Oxford. Reinstating a rail route between Oxford and Cambridge has long been in the pipeline with the connection between Bicester Village and Bedford closed since the 1960s. East West Rail is being built progressively in sections. Phase 1 between Oxford and Bicester was completed in late 2016, phase 2 will see major track and signalling upgrades extending services from Oxford to Bedford and Milton Keynes to Aylesbury. Development in the plans took a step forward last October when the transport secretary Chris Grayling visited Bicester to see first-hand how spades in the ground were laying the foundations for construction. On the same day, Grayling announced £20m of funding for the development of a strategic outline business case. This forms the basis for an engagement session due to be held in February where interested organisations can have their say and the public consultation which has been launched detailing the five route alternatives. 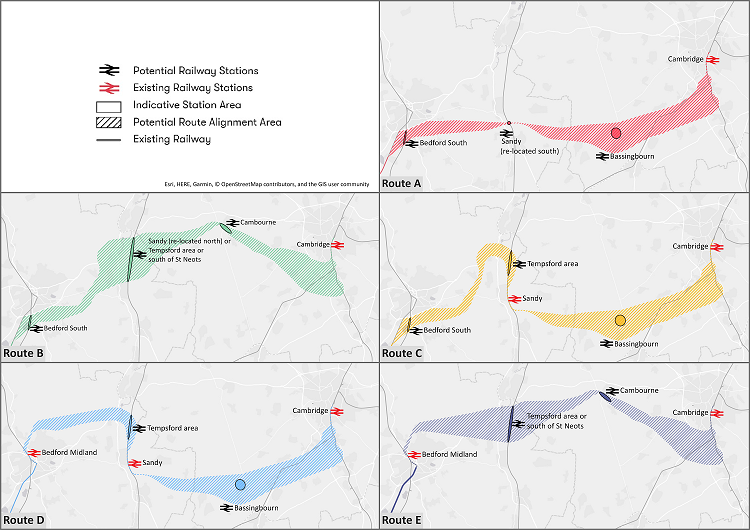 The consultation includes consideration of the possible locations of a new station at Bedford and how this can fully connect to the centre of the town, and how best the railway can interchange with both the Midland and East Coast Main Lines. Once complete, the east-west rail link will form a key section of a new £7bn infrastructure network between Oxford, Milton Keynes and Cambridge, dubbed the "brain-belt" arc. The National Infrastructure Commission has long been a big supporter of the railway and is now urging residents to have their say on what would work best for them. Its report, Partnering for Prosperity, argued that one million new homes would be needed between now and 2050, to support the future economic growth of the area, increasing its contribution to the national economy from £90billion to £250billion a year.